A series of seminars organised by London College of Fashion explore how digital media presents new methods and opportunities for people to actively engage in fashion. The first seminar presented Dr Agnes Rocamora in conversation with Susie Bubble from fashion blog Style Bubble. Susie's blog has attracted a mass following with approx 15,000 hits a day! The seminar explored her methods, process and writing style reflecting an honest account of a love and commitment to fashion. The second event with take place on Wednesday 11th February 2009, 5.30pm, Rootstein Hopkins East Space, London College of Fashion. Hosting Dr Julia Gaimster (LCF) in conversation with Iris Ophelia, Second Life Fashion Correspondent. 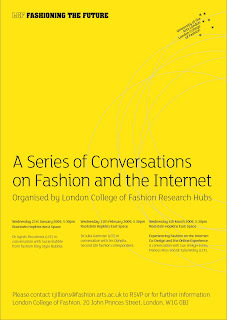 The series will close with a seminar on Experiencing Fashion and the Internet: Co-Design and Online experience. This event will host a conversation with Sue Jenkyn-Jones, Frances Ross and Dr Julia Wolny (LCF). thanks Jen, nice to see what's going on in London.